This was a significant project with significant integration for one of the leading youth market tour operators in the world. Mr Zen has had a relationship with Topdeck Travel for a number of years. The key challenges for Topdeck were to produce a website that would run from their back offce system providing availability, dates, prices, full online booking and a my account area. Mr Zen created a website for Topdeck, based on designs from a third party agency, integrated product information from their reservations system, created online booking for passengers and agents, and an after sales 'Manage my account' area called My Topdeck. The site was a very early responsive website but has stood the test of time and had handled many millions of pounds of transactions over the years. We have used a hugely powerful indexing system to catalogue Topdeck’s tours which enables us to be able to filter the search results by multiple criteria in an instant. The information contained within the index also includes availability information making it an extremely powerful search tool. 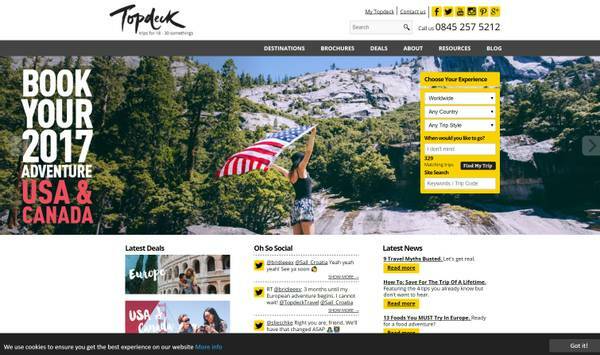 Topdeck use social media extensively to communicate with their customer base of young travellers living across the globe. We have pulled in feeds of this data into the website to weave it into the customer journey. High on the list of Topdeck’s requirements was the ability for the site to respond to all mobile platforms. With this in mind, we used a responsive CSS library to re-shape the site when the size of the browser is changed. This ensures that the site works on all devices and that links to the main website also work when viewed on a mobile device (ie no separate Mobile website). In addition to displaying the content online, the content can also be delivered via a feed of XML data which can be set up and used by 3rd party agents to populate their systems and keep their availability data up to date. Users of the system can be set up and certain items or currencies can be restricted, giving Topdeck full control over the information in their feed. This feed can also be customised, and specific feeds can be created and chosen for specific suppliers. Multiple load balanced servers (with scaling) in Cloud Environment, RDS Scalable Database server, Worldwide CDN for content delivery worldwide, Private Network with VPN connections to internal systems for secure communication. Caching is done with custom built plugins to handle the set up of the Topdeck System.